Being trained as both an architect and an architectural-engineering technologist enables Louis to effectively communicate ideas with clients and design colleagues from both a design and technical perspective, while bridging the gap between art and science. This unique skill set also allows Louis to identify synergies between the various building systems and maximize value for the client. Louis has over 25 years of architectural experience, 23 of those as a Registered Architect. Louis’ experience at aodbt dates back to being a summer student in 1991 and 1992 while attending architecture school at Montana State University. 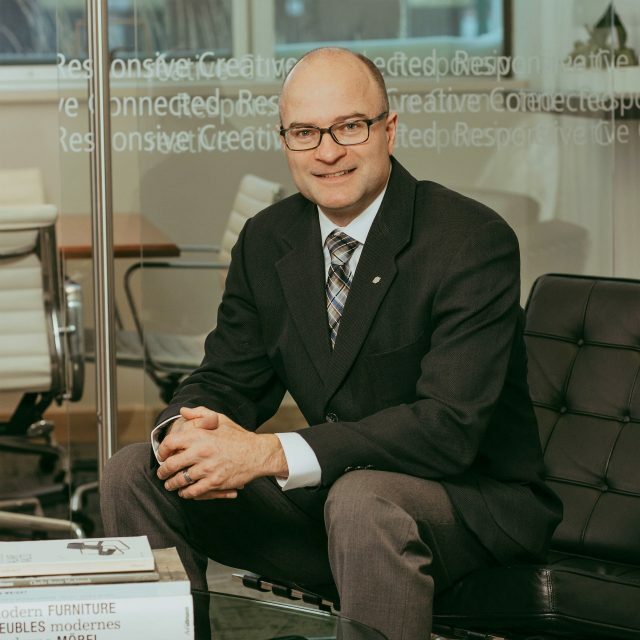 Louis has found his way back to aodbt in 2010 after working for two of the largest Calgary-based architectural practices between 1996 – 2010. Louis has been instrumental in the successful completion of many projects from Agassiz, BC to New York City. Louis has been the project architect or the design architect on projects ranging from police headquarters, laboratories at three Agriculture and Agri-Food Canada research facilities, schools in Alberta and Saskatchewan, the expansion to the Air Terminal Building at the Calgary International Airport, post-secondary educational projects, commercial office buildings, multi-family residential complexes, and recreational facilities (including renovations to the Calgary Saddledome). Given his wide breadth of project experience, Louis brings an innovative and integrated approach to each project. His attention to detail and ability to develop long-lasting relationships with clients continue to be valuable assets throughout the design and construction process.